Why do players (and agents) love free agency so much? Bloated contracts, of course. Once a bunch of rich owners start bidding against each other, everyone loses their minds and prices for Pro Bowl players reach All-Pro levels. This is how pretenders like Albert Haynesworth get a $100 million contract while, in return, the team that signed him (Washington) gets to miss the playoffs. 1. At $36.25 million over five years, Decker’s deal is more than fair for a receiver of his caliber. Think about this: two years ago, 29-year-old free agent wideout Vincent Jackson signed with Tampa Bay for $55.55 million over five years. Jackson, at that point, had accumulated three 1,000-yard seasons in seven years with the Chargers—six with five-time Pro Bowl quarterback Philip Rivers. 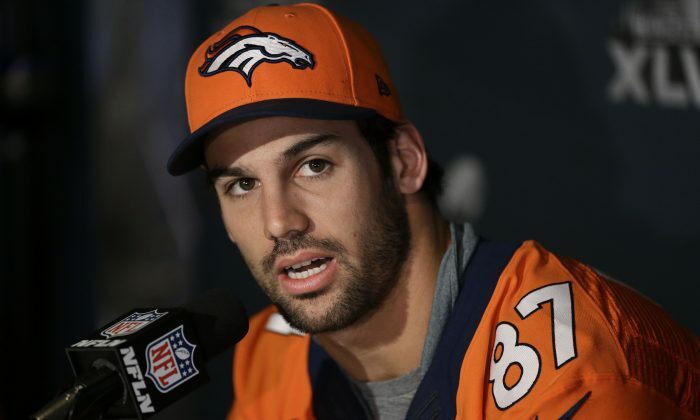 Decker, who turns 27 this offseason, has two 1,000-yard seasons under his belt after four years in Denver—granted, both came with five-time NFL MVP Peyton Manning throwing him the ball. But to get a receiver that’s comparable to Jackson, who is two years younger, and for $20 million less, is quite a coup for the Jets—especially in the first two days of free agency. Whether Decker is actually a No. 1 or No. 2 receiver is too hard to say at this point. Once he goes from catching passes from the greatest of all-time in Manning to the erratic arm of Geno Smith, we’ll know a lot more. Either way, the Jets aren’t really paying him like he’s a one. 2. The Jets obviously have a need at receiver. Actually they have a need at quarterback too, but rarely does someone like a Drew Brees ever hit the market so let’s stop dreaming. Last year, their top receiving option was Santonio Holmes, who caught just 23 passes for 456 yards in 11 games. Holmes and his bloated salary are now gone, though as unproductive as he’d been the last two seasons (playing just 15 games) who else were they going to trot out there? As a side note, Jeremy Kerley has been a great find, and more productive, but he’s best in the slot. 3. Decker carries himself well. The former Minnesota Golden Gopher doesn’t come to the Jets because his former team didn’t want him—like Holmes did four years ago from the Steelers. With Demaryius Thomas, Wes Welker, and Julius Thomas holding down the receiving game, the Broncos didn’t need to invest any more money in that area—not that it doesn’t work to take another team’s headache. Let’s face it: giving up a fifth-round pick for Holmes four years ago, was a low-risk, high-reward move for the Jets that paid off. He helped lead the Jets to the AFC title game, where they lost. What didn’t pay off was then signing Holmes to a five year, $45 million extension to a guy who had plenty of baggage—something Decker doesn’t come with. 4. Now the Jets don’t feel obligated to take a receiver in the first round of the draft. The Jets still need more help at receiver, but receivers are very difficult to judge come draft time. Case in point: Wes Welker, who has led the league in receptions three times, went undrafted in 2004. Even 2010 NFL leading-rusher Arian Foster went unselected in 2009. Granted, the draft is a crapshoot all over, but more often than not the late-round gems that are found are skill players as opposed to lineman, and the Jets could still use help on the line.